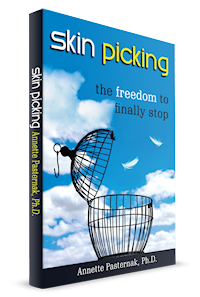 How annoying is it when someone tells you to “stop picking”? Like when you’re simply sitting next to them “just” watching TV. Whether you’ve been told this by a parent, a significant other, or even by a teacher who shamed you in class with a phrase like, “stop touching your face” or “get your fingers out of your hair,” well, I don’t need to tell you… it’s no fun. Chances are, you didn’t even know you were doing it, and it’s embarrassing to have it brought to your attention. And if these are the people who say something, you may be wondering how many other people also notice but wouldn’t consider saying anything. These are personal issues, and we deserve to have our own personal sense of control about them. But we feel out of control, partly because we often do these behaviors without realizing it, without awareness. Hey, there actually is such a thing! And people are loving it. I recommend it often, and several of my coaching clients are finding it a valuable awareness aid. I’m talking about the smart bracelet, called Keen, made by the company Habitaware. Aneela kept her trichotillomania (hair pulling behavior) a secret from her husband for years. Until one day he caught her. And then this thing she had feared (him finding out) turned out to be the best thing for her (and maybe for you), because then he was actually able to help her by developing this product. Watch the video or read the transcript below it. But if you just want to buy a Keen (or two) right now, visit Habitaware. Use the code “FREEDOM” to get a 15% discount through 2/23/18. 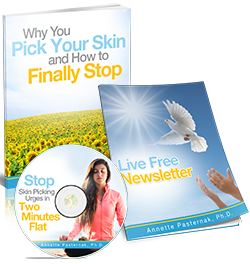 Annette: I am Annette, the Stop Skin Picking Coach, and I’m here today with Aneela. Aneela: So nice to be back. Annette: Yeah. We did this about a year and a half ago. So Aneela is one of the co-founders of HabitAware, which makes this amazing bracelet. You can show yours, right? The Keen bracelet. Oh, she’s got one on each arm. Wonderful. 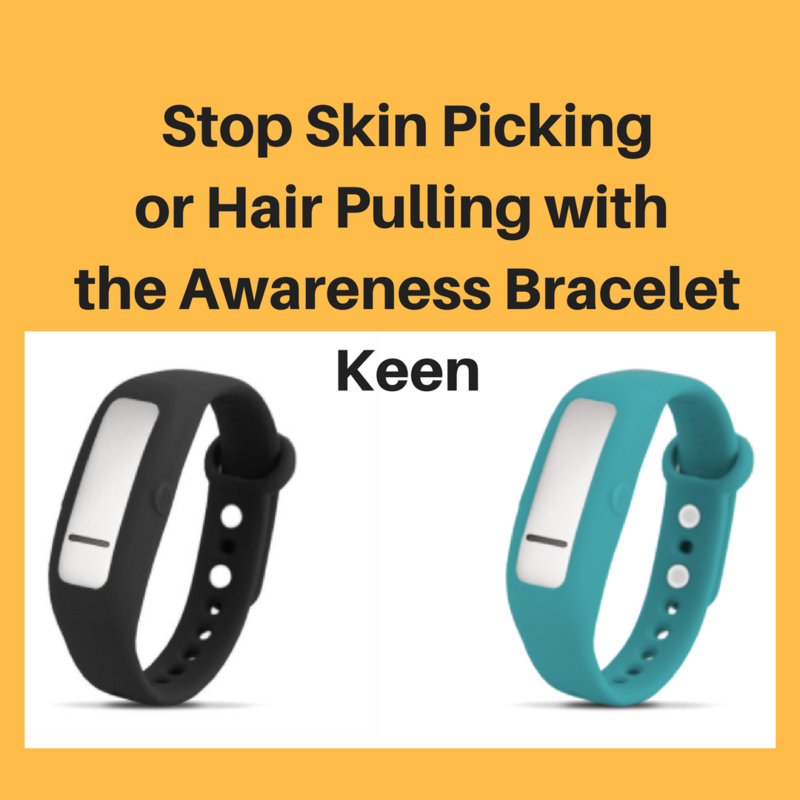 The Awareness bracelet to help you stop picking or other compulsive behaviors. So thank you so much for taking the time to be with us again. Aneela: Thank you. It’s so exciting to be back. Aneela: I’ve been watching all your videos the last year and a half and more. It’s been exciting to see all the things that you’ve been talking about, and to be back on. Annette: Yeah. Well, thank you for watching. I’m excited. So yeah. We’re definitely mutual fans of each other’s work. So a year and a half ago when you were on, you guys were pre-selling the Keen bracelet, which actually then had been called another name. So it’s been regular sales for almost a year now. Is that correct? Aneela: Yep. We officially launched in late March, early April of 2017. So almost coming up on the anniversary. It’s pretty exciting. Annette: It’s very exciting. Yeah. So why don’t we just start, though, because I’m sure not everybody seeing this video knows anything about it, so yeah, if you could just start at the beginning. Tell us what it is and a quick story of how it was developed. Aneela: Absolutely. So I have a hair pulling disorder, trichotillomania, which is basically a sister disorder to skin picking. A couple years ago, my husband found out that I have this disorder. So for about 20 years, since my early teens, up until now, I’d been hiding it. I used to pull from my eyebrows and my eyelashes. So I would just put makeup on, eye makeup, to cover it up. Then one day, he just saw me before I could get my makeup on in time, and said, “Where are your eyebrows?” So I finally shared my hair pulling secret with him. That, in and of itself, set me off on a little bit of a journey with my relationship with my trich, but it also opened up the conversation with my husband, basically, for us to work together to find a tool to help me. That tool is now the Keen bracelet, which essentially what it does is you train it for your specific behavior with an iPhone or an Android app, and Keen just is looking for the movement of the hand. It will vibrate to let you know when your hands are not where you want them to be. So you train it for, if you look for skin imperfections on your face or on your back, or if you’re pulling your hair, and you’re looking for those weird feeling hairs that you just need to get. So you train the bracelet from that. Then when it senses a match, that vibration is just shifting it from the subconscious to the conscious mind so you can actually effect change. Annette: Thank you for that. It’s a fantastic tool. I have been working with clients who are using this. There’s that other video. I just saw it was on your website, the one with Genevieve. Annette: It’s such a great tool for my clients and for people who don’t really quite need coaching or therapy. You know? I mean, it’s just like if this is not a complex issue for you, and it’s literally just an unconscious habit that you have especially, it’s so fantastic. Aneela: Yeah. We’re hoping, I truly believe that therapy and coaching and things like that are absolutely needed, so my hope is that treatment professionals can integrate it into the way that they’re working with their patients. But yeah, I mean, not everyone has access, not everyone has the time to take off from work to see a psychologist weekly or the health insurance to make it happen. So we’re trying. We’re trying to help people at least with that first piece of awareness. Then once you have that awareness, it’s still work. It’s still the steps to take to learn to replace the behavior with things that are more positive. Ideally, a coach or a therapist, a psychologist can be there to guide you on that side, but our goal is to first get you to that first step. You can’t change what you don’t know. So that’s where we’re coming in. Then the ideal scenario would be use it with someone who can coach you through that, but we’re working on ways to get to that point as well where we can help out a little bit, especially for those folks that don’t have the access to someone. Aneela: Yeah. So it’s been pretty exciting. We launched in April 2017, and the cool thing is we’re helping people around the world. Thousands of people around the world are wearing these bracelets, and getting better. Of course, it’s a spectrum in terms of what we get in in terms of feedback. Feedback is usually, “Oh, I wish it had that,” or, “I wish it had this.” We’re taking notes. We have our own ideas that we’re working on. Almost every day, we’ll get an email in from someone saying thank you. You’re changing my life. Those are the tear jerkers. We try to keep those all in one place so everyone on the team can see them, and it just gets us so pumped to know that we’re helping people. Of course, we’re helping people, there’s still work to be done. We still have support tickets coming in to work out some kinks and stuff. So we’re seeing, we’re watching what’s trending to figure out, okay, what do we need to do to fix things, and we’re trying to get ahead of stuff. We’re absolutely taking family’s feedback into consideration to help us fix stuff, and make it better. Annette: So as far as types of let’s say people picking their skin, correct me if I’m wrong, Keen will work for picking at your head, picking anywhere on your face, also shoulders if you do this, yeah? Not fingers yet? Aneela: So shoulders, arms. Finger picking is very dependent on the person. So if the person picks kind of just with their fingers, it’s not going to work, but if there’s that wrist motion, then because that’s where the bracelet is, that’s where the detection is so that’s actually going to be happening, then it should work. Aneela: I think one of the ones that we get probably the most false alarms with is the chest area, because keyboards and stuff, it’s the same. What I always do is I show people like when I’m doing my eyebrow pulling, and then you go like this, it’s the same plane of motion. So for me, driving was a false alarm. Then in the app, you can adjust and tighten those settings to eliminate them. I think with that chest area, again, it’s sort of that same plane of motion for typing, which, again, the settings you should be able to tweak, but I don’t know for sure, because it’s really hard to replicate or us to fake it to replicate. Then when we get questions in, oftentimes, we’ll send our email with here’s things to try. Then we just assume if you’re not writing back that you figured it out, it’s working for you. Annette: That’s really helpful to know, because then the viewer can decide like, oh, is this something I want to fight with, put some effort into just in case if their main picking area is on the chest. How about legs? Aneela: Yeah. I think it’s working for legs. Again, I can’t replicate, but I know people who have said that they’re using it for their legs. Again, my assumption is if we’re not hearing from them, no news is good news kind of thing. So I would assume that it’s working. Annette: Okay. Super. Yeah. I’ve heard good things about your customer service by the way. Aneela: All Carla. So our team is growing, too, which is pretty exciting. So my friend, Carla, is now on our team. She’s our director of customer success, and she’s helping us, yeah, do exactly that to help people, do training calls so that we can show people exactly what’s right for their behavior, like how to set up the detection settings for their behavior, how to train. So yeah. It’s been awesome. I actually really love doing that, because I love interacting with everyone, but there is just so much to do. It’s a good thing that our team is growing. It means good things are happening for us, and hopefully that will translate into good things for our community. Annette: Definitely. I love that there’s still such a personal touch even though now it’s somebody else that’s your customer care person that it’s really easy for a person to get ahold of a person to help them. Considering the cost of this, which is pretty low, that’s really amazing. I don’t know what the customer service is like at Fitbit or whatever. I was curious, so I’m working with a teenager who’s been using it, and that’s actually one of the first things I helped her with was the false, she was like, “It’s just going off all the time.” I’m like, “Okay. Let’s look.” I found it in about two seconds on your website that just we had to go to the app, and it’s a sliding thing to adjust the tightness I think it was called. Annette: So that was super. She was like, “Okay. Great. Problem solved.” Then we had to deal with her a little bit psychological reluctance to wear it, because I think she was afraid of people asking about it. She didn’t really want to talk about it. So I went through with her, “Well, what’s the worst case scenario? What’s the worst thing that could happen? What’s the best? What would you want to happen? What’s most likely?” You know, that kind of a process. Do you have any tips? What do people say? Aneela: So we’ve purposely designed it to blend in. Right? It looks like other things on the market. So you could just say, “It’s my activity tracker.” You’re not lying. If people are going to push, what brand, where’d you buy it, I mean, then you just say, “Oh, I got it as a gift.” That’s it, right? Aneela: Done. Right. But my hope is that it can be a conversation piece, and that’s what we’re seeing a little bit of. What’s that? Oh, it’s this thing that, I have this disorder called skin picking, I do this thing, and this is helping me get better. Maybe you using it as a conversation tool helps actually bring it out. Right? I personally think that it’s the hoarding of the secret and the covering it up, and I went through it. I mean, it’s painful, because you do get questions. Where’s your eyebrows? I can remember people looking at me, talking to me face to face, and our eyes are lined up, and I can see the wheels turning in their head like, “Where’s her eyebrows? Where are her lashes? Something looks weird.” You can kind of guess what they’re thinking. If you can get rid of that feeling and that shame and just share, you are so much closer to that road to recovery, because that bag that you’re carrying for so long, you can just leave it, and you can run. You know what I mean? Annette: I know what you mean. Aneela: It’s just so freeing. So my hope is that people will use it as a way to shift the conversation. Even with parents and their kids, instead of, “Oh, little Janie, did you pull today at school,” it’s, “Hey, let’s check your Keen stats. Let’s see how it’s going.” Right? Aneela: So shifting that conversation to be positive, to not be about the behavior, but maybe about the activity, or just away from you’re doing this to yourself kind of thing, which is the mentality. Right? So if we can flip that and say, I mean, think about people with cancer. If I had cancer, it’s not me saying I want my blood cells to be eating at each other. I mean, it’s the same. It’s not me saying I want to pull out my hair. So why do other people think that, and why do I think that? So if you can change that perception of what this really is, first for yourself, then it gets easier to start sharing it with other people, because then you’re changing the language as you share. So I don’t even know if I answered your question. Annette: Yeah. You did. I mean, in the beginning, and then you gave some other really good insight. Aneela: So I just go off on a tangent on that all the time, just because I want people to share, because that is the cure to me. That is the cure, to get it off your chest, to get it off your back, and to just start living your life, and to stop caring what other people think, which is really hard to do. That’s how I’ve lived my life for my entirety. It’s retraining away from that. Annette: Wow. We’re both very public. Yeah. Not everybody is ready to share. Aneela: Yeah. No. Absolutely. It’s a journey. I mean, right? Aneela: I’m sure it took you time to get to where you are. It took me ages to get to where I am. Everyone has their own time, but I just hope, I just want to plant the seed, right, so that one day it will bloom. Annette: Yeah. So since it’s come out, I think you’ve updated the software. Is that correct? Do you do that continuously every time you feel like there’s an important change? Aneela: Yep. So that first one, we were definitely getting right at the beginning some feedback about false alarms. So we’ve upgraded the algorithm. That’s since gotten better. We’ve seen those issues taper. We’re still getting them, but we send our list of try this, try that, do a video call, and then usually we’re able to get people to where they need to be. So it’s going well. Yeah, we’re absolutely always trying to work on new things. We have app updates that we’re working on right now that we’ll push out fairly soon. I’m a little bit of a hold up there, so we’re getting to it. We’re getting there. Annette: Get on it, Aneela. Annette: Yeah. Is there anything that you can share that’s coming up? Aneela: Some design tweaks just to make it a little bit more easy to go through the training process, and just to make some of the features more apparent, like, hey, you can click into here. You can do things in this area. Then within the app, you can actually start tracking your behavior. So we’re adding some features to that section to make it a little more robust for people. Annette: Cool. Yeah. I saw that. Right now you have to tap it when you want it to track. Do you still have to do that? Aneela: Yeah. So you’ll still need to push the button to say, yes, I pulled or, yes, I picked, or, yes, I engaged in the behavior. The reason for that is there are false alarms, so we don’t want to count every single vibration as a you engaged in the behavior. Plus, I can be playing up here, and it can go off, but I may not actually pull. That’s pretty much where I am now, right? So we don’t want to ding you for something that didn’t happen. So we want you to acknowledge it. Psychologists say that’s part of building your awareness, right? You’re acknowledging that you’re engaging so you’re building your awareness, you’re building your relationship with the behavior instead of ignoring it. So that will not change, at least not for a while. Never say never. Annette: One thing I’m curious about, do you guys see the data? Have you been analyzing it or do you have any plans to learn things from it? Aneela: Yeah. So we can’t see whose data it is. We can’t see exactly what’s going on. We can see some high level stuff, but that’s something that as we start diving into, we can maybe start analyzing a little bit more and start seeing what we can do and how we can play with that to see what else we can be doing to improve the bracelet. Annette: Do you have plans for any other products or this is it? Aneela: No. We are excited about our trajectory. We have a lot of ideas. We’re working on a couple things. So yeah, stay tuned. Annette: Yeah. I absolutely will. Yeah. So I’m wondering how long it takes to work for people. I imagine there is probably a real wide variety of time. Aneela: Yeah. So I think to your point, it’s going to vary for everyone, right? If you’re in it, and you’re dedicated, and you’re wearing it every day, I would say within those first few days, you’re starting to heighten your awareness within the first week, two weeks. My goal is for you to get consistent, and wear the bracelet every day, so that you are retraining, you are noticing where your hands are to the point where you don’t need these at some point. Right? We get emails in where people will start saying, “Hey, I’m noticing before Keen does.” I’m like, “Hey, that means it’s working. You’re doing it.” So yeah. Anywhere from a couple of days to two weeks. I mean, the thing with things like skin and hair is to see the results is going to take time, because hair takes time to grow, or even the skin takes time to heal itself and to repair. So I think for that, there’s no instant gratification, which I think people are just so used to getting right now. So I think that’s what makes it a little bit hard for people I think to stick with it. Like, “Is it working? Is it working?” It takes time. Annette: I think that’s also a hallmark of this disorder is this just losing hope so quickly, and just the importance of being persistent. Yeah. I mean, I’m used to hammering this over the head. I have to encourage people. You can’t just wear this for the one time when you think you’re most vulnerable to picking, because sometimes you end up picking here, and sometimes you end up picking there, too. So I think the best practice is like you say, you make a habit of putting it on when you put your clothes on in the morning, and wear it all night, plug it in every night, and then, yeah, rinse and repeat. Aneela: Yeah. You just did a video I think about why is it not working. It’s the consistency. You have to give it time. You’re not going to learn French in a day. You have to practice. It’s the same exact thing. You have to do the hard work to take control, which, again, I think we just live in a day and age where everything is right at our fingertips. Right? You just want it right away. 20 years is not going to get erased in two hours with Keen, right? It’s work. It’s a process. I think also you start uncovering other things as well. For me, I didn’t realize that had trich, I mean, I knew I had trich in my teens, but I didn’t realize that part of the reason was because I had anxiety. I didn’t have that language as a teenager in the ’80s to say, “Oh, these things I’m feeling is anxiety.” Now, in my 30s, looking back, I’m thinking of all these rush of memories coming back. I’m like, “Whoa. That was anxiety. That was anxiety.” Right? It was all feeding the trich. So now it’s, “Okay. So I’m working on my trich, but now I need to work on this other thing. Oh, okay. So now I have more work to do.” But it’s great, because it’s like domino effect. You stat working on one area of your life, and like cleaning up your house, you clean one room, and now you’re cleaning the next. Okay. Now, the kids have made a mess in that room that you just cleaned, so you got to keep at it. That’s the journey. Annette: Yeah. It’s important to pick one thing at a time also. Annette: … you get so overwhelmed. Right. You don’t do anything. Annette: Take stock, take a survey, and then decide what’s the one thing I can do right now that’s going to move the needle the most for me. Then you get that into play, get that to be a habit or whatever, and then choose, okay, what’s the next thing I can do. Aneela: One thing, right, to start. Annette: … right now, we are going to have a code for you to get a discount on this. I’ll put that in the description below the YouTube video. Aneela: Yeah. Exactly. If you’re ready, this Keen could be that one thing that you start with. You start with building that awareness, and then, okay, once you have those awareness muscles, then you start replacing and figuring out is it squeezy balls, is it yoga, is it deep breathing? Find out what works for you, and then you can really say, “Okay. This piece of me is getting rounded out.” Now, you can start looking at, okay, well, was anxiety the driver? Let’s start looking at that. Let’s start learning. Honestly, if you’re starting to learn to replace the behavior, things like deep breathing and stuff are going to help you with the anxiety. So even while you’re starting to focus on that one, it may actually help with other stuff. Annette: Even stopping the behavior usually helps with the anxiety. I mean, did you find that as well, or you’re just noticing now you have more anxiety? Aneela: I don’t have more anxiety. I think now it’s apparent that I have it, if that makes sense. The trich was the thing, right? Annette: Yeah. You weren’t letting yourself feel it really. Aneela: Yeah. Exactly. So now, I’m working on that, and it’s been really good. I mean, for me, I think part of my anxiety was are people going to notice, are people going to notice, are people going to notice. You know? Aneela: Once I, you know, now these are real. So that anxiety. Aneela: Now that anxiety is gone. But yeah, definitely social anxiety and stuff beyond just that, so working on it, noticing. You can’t deal with it if you’re not aware of it. So now I’m aware. Annette: So is there anything else you’d like to share? Aneela: No. I think we covered a lot of stuff about where we were with Keen and where we are now, and just thank you for having me on again. I’m looking forward to having some of your viewers join our Keen family, and that journey to awareness. I’m excited, and always happy to chat with anyone who has questions. You can shoot me an email. I’m easy to find. Annette: All right. Thank you so much, Aneela, for coming on again, and again for inventing this wonderful thing, or co-inventing. Aneela: I just said I wanted it, and then my husband made it. Annette: Yeah. Your husband did all the work. Well, let’s thank him, too. Thank you, Sameer, wherever you are. Aneela: And John and Kirk. Yeah. We’re excited. It’s been really fun as a team to do all this stuff. Yeah. Annette: Yeah. Super. Well, I’m looking forward to seeing where you guys go. Get your Keen(s) here. Use the code “FREEDOM” to get a 15% discount through 2/23/18. Hi Annette, hi Aneela, I would love to get one of the bracelets but just missed the promo window. Would you guys maybe consider extending the offer? :-) maybe get a permanent code for Annette’s clients :-) that would be so awesome! !